When I think of the Greek Food Festival, I think of my wedding day. Of course, I had absolutely no intention of attending the festival that year, which began the day before our nuptials. A girl can’t be bothered when she’s got to rest up, get her hair done and spend the rest of the day at the church-house getting ready to marry her best bud. Then, we’d be off to our honeymoon; no time for a stop-off…. So, my dad is gone. Early in the morning hours of April 7, the day before Easter, he quietly left this world from the beautiful Hospice Home Care inpatient facility in Little Rock. I have recently attempted not to dump personal information on this blog too much. But I think it applies, since much of the story has involved food and the way it affects every element of our lives. As mentioned in my earlier post, we tried to use food as a healing agent. However, sometimes it’s just time to let go, and that’s what we had to do. Then, it was time for my mom and I to heal. Rather, it was time to start the healing process, which will likely take some time. Food will play a role here, too. Southern Baptist funeral weeks are a flurry of food, as I’m sure they are for just about anyone in the South and beyond. It’s a purposeful hijacking of Maslow’s Hierarchy of Needs, taking care of the mourners’ basic requirements so they can focus on other things, or nothing at all, for a little while. To allow time to heal. Another friend heeded my unashamed Facebook request for hot milk cakes from Dempsey Bakery. This gave me both a breakfast option for a few days as well as a suitable dessert to enjoy while the rest of the family ate coconut cakes, chocolate cakes and poundcakes that were delivered to my mom’s house. Our refrigerators have been mounded over with delicious sandwich meat and cheese; lovingly constructed casseroles; tangy, bacon-laden barbecue beans; perfectly seasoned green beans; intricate salads with avocado and veggies and the like. For a few days, we were able to focus on our family while feasting together and talking, sharing memories. Going through paperwork. Moving on to the next stage of life, whatever that is. Before you ask, we really are okay, or at least we will be. Without imposing our beliefs on you (well, maybe just a little…), Daddy is okay, too. In fact, he’s awesome. And we’ll get to hang out with him again someday, over a big banquet. I’ll bet the casseroles there are incredible. P.S. I’m still moving forward with the Food Blogger Bake Sale on April 28, benefiting Share Our Strength. That happens to be my dad’s birthday. Help me honor the day by raising a bunch of money to help those who don’t have the comfort of enough food to eat. Details coming soon. 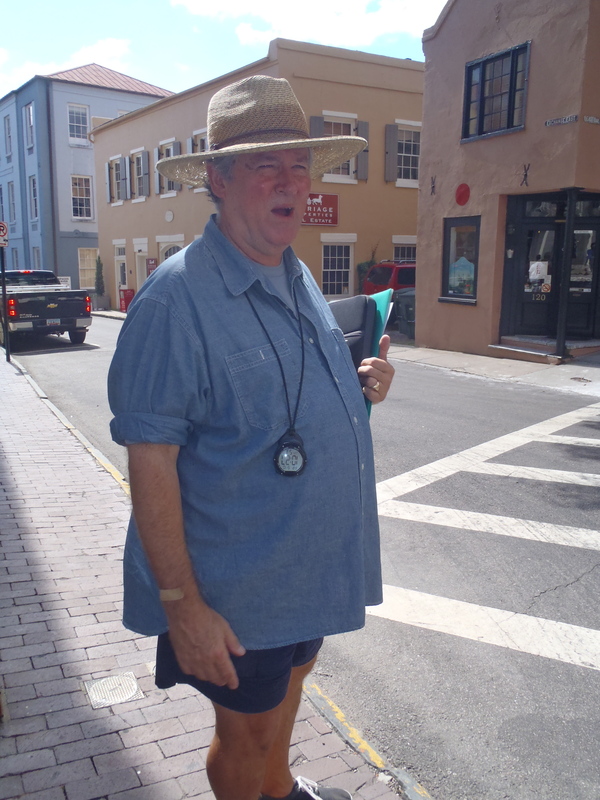 Our tour guide from Culinary Tours of Charleston/Bulldog Tours, Hoon Calhoun, kept us in line on the meandering cobblestone streets of downtown Charleston. My family and I recently returned from a vacation in Charleston, South Carolina. Let me summarize: This is a foodie town. Of course, there’s plenty else to do (we went to three different beaches, and I still managed to get home whiter than when I left). But if you love food, especially the history, technique, local ingredients and passion behind it, Charleston is your kind of town. I was only there just short of a week and didn’t experience all it had to offer, but I wanted to share some highlights, especially from a behind-the-scenes kitchen tour I took. The “chef’s kitchen” tour is presented by Culinary Tours of Charleston, a division of Bulldog Tours. Tasting tours are available daily, but this specialty tour is only given once a week, on Friday mornings. I had to go alone, as we had no childcare options that day. This was fine with our two kids; they were happy with Daddy’s arrangements to wear swimsuits and frolic in a couple public fountains made for such enjoyment while I completed my 2 1/2 hour tour. Our tour began with coffee, cheese grits (yom) and a light, orange-zest laced cinnamon roll at Barbara Jean’s, while our tour guide, Hoon Calhoun, regaled us with the historical basis for Charleston food culture. Of course, much of this culture revolves around its origins as an early British colony (read: [King] Charles’ Town) and its subsequent agriculture-based, slave-fueled plantation lifestyle. During these times, elaborate meals showcased the region’s bountiful resources of vegetables, rice, and seafood in concert not seen elsewhere in the world. Upon the official end of slavery with the Emancipation Proclamation, Charleston’s food landscape changed. Busy working women, former slaves and owners alike, now found themselves in the fields all day rather than cooking. This was the beginning of modern Southern high-fat, quick-cooking methods, as well as peasant-style stews and other items that could cook all day. Calhoun noted that today’s Charleston marks a return to the earlier form of cookery: fresh, refined and celebratory of all the region has to offer. An interesting note: Why does Charleston no longer wear its former crown as rice capital of the region? Calhoun said that ships from China would come to Charleston for its coveted rice. The answer also lies in the end of slavery. Heavy machinery replaced slave labor, and the silty soil of the region could not support the equipment. Rice production moved to states with sturdier soils, including Arkansas. With this knowledge in hand, our group moved on to tour the kitchens, taste the food, and visit with the chefs who are keeping Charleston’s food culture one of the most dynamic in the world. Chef Sam Choy working with Pulaski Tech students at an event in Pine Bluff on Sunday. Photo by Bree Robinson. Come on, admit it. You’re a food celeb junkie. 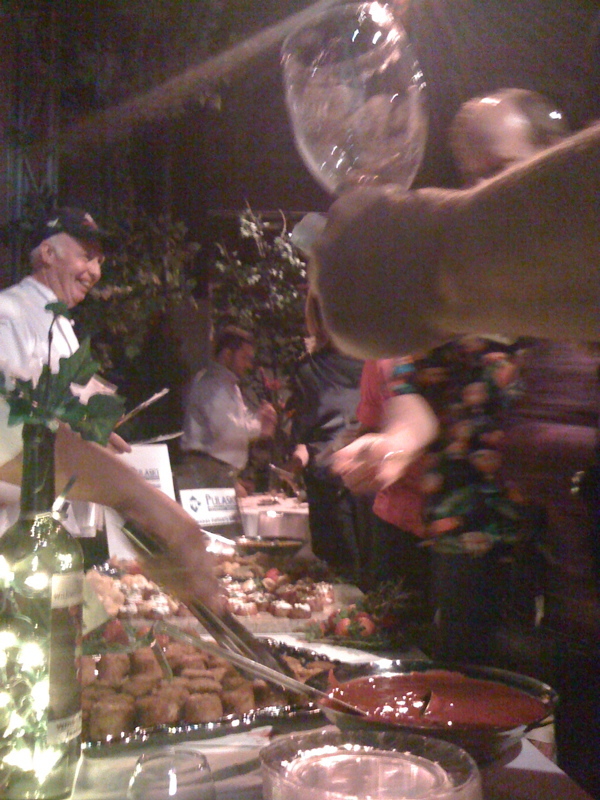 You watch Paula and Bobby and (swoon) Alton, secretly wishing you could be one of those folks standing right by the foodlicious action. Tomorrow morning, you’ll have just such a chance. Skip work if you must. Award-winning restaurateur, best-selling cookbook author and TV host Sam Choy will give a cooking demonstration beginning at 9:30 a.m. on Tuesday, Nov. 2, in the concourse area under the skylight at Pulaski Technical College’s Little Rock-South site, located at 13000 Interstate 30. The demo is free and open to the public. Like the culinary students at Pulaski Tech, Chef Choy got his start at a community college in his native Hawaii. He grew up in the small town of Laie on the North Shore of Oahu where he learned to cook in his father’s restaurant, The Hukilau Café. On the weekends, the family prepared traditional Hawaiian luaus for large groups of tourists. Choy’s mother, Clairemoana, enrolled him in the local Kapiolani Community College, and Sam flourished in the culinary arts program. After honing his skills in major hotels and receiving increased recognition for his talent, Sam opened his first stand-alone restaurant in 1991 on the Big Island of Hawaii. Today he owns several restaurants around the world and has written more than a dozen cookbooks. He has appeared in several Food Network programs, including Ready… Set… Cook! and Iron Chef America. Choy also has designed Hawaiian-inspired dishes for American Airlines first class passengers to and from Hawaii. Chef Choy’s visit will be his second to the PTC Arkansas Culinary School. As I mentioned earlier, I (somehow) won Foodista.com’s Best of Food Blogs contest and was selected to appear in a book of their favorite 100 blogger recipes. It was a crowd-sourced publishing experiment in merging the two things we foodies love best: blogs and printed cookbooks. The book, Foodista Best of Food Blogs Cookbook: 100 Great Recipes, Photographs, and Voices, published today! I haven’t received my hard copy yet, but from the images and photos on Amazon, it looks fabulous. I had thought my photo was on the cover, but that was just Foodista’s promotional poster. No matter, it’s gorgeous and brilliant (I read some with Amazon’s “Look Inside” feature) and I’m SPAZZING OUT I’M SO EXCITED!!! So, how abouts you pick up a copy at the link above? (Click the book cover image.) From what I’ve read, it has lots and lots of inspiring recipes, not to mention the snazzy writing of 99 of my fellow food bloggers. And me. I’m on pages 174-175. I’m giving you one week, so your deadline is next Tuesday, October 26 at noon, Central time. UPDATE: Just to be clear, travel is on your own. It’s here! My favorite convention of the year, the Arkansas Hospitality Association. Today, several of my fellow students and I are eating, looking and learning; booths here range from large food purveyors such as Ben E. Keith and Sysco to hotel service providers and restaurants. Meanwhile, the annual Iron Chef competition booms in the background. I’ll bring you updates on each heat as they come in. 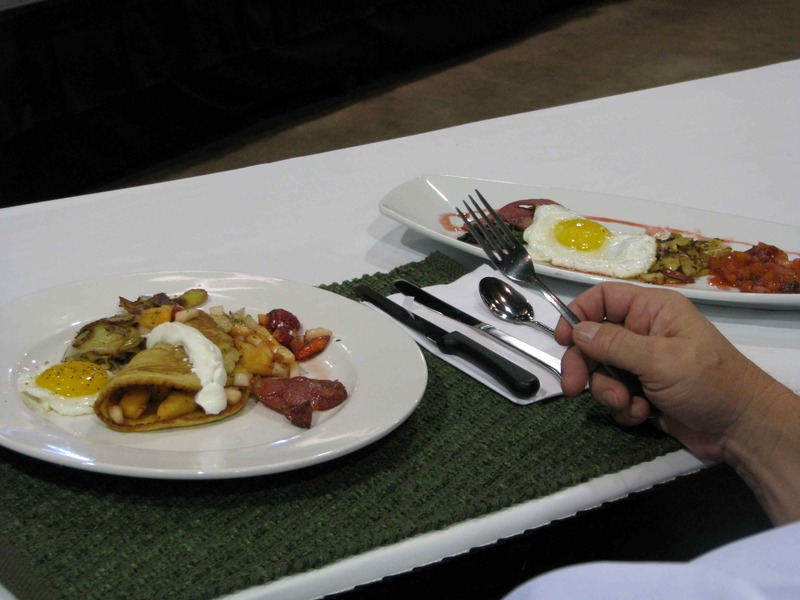 Egg dishes from Heat 2. Heat 2: Jason Knapp and Doug Spharler of Pulaski Tech vs. Lewis Curtis and J. Matt Lile of Lulav. 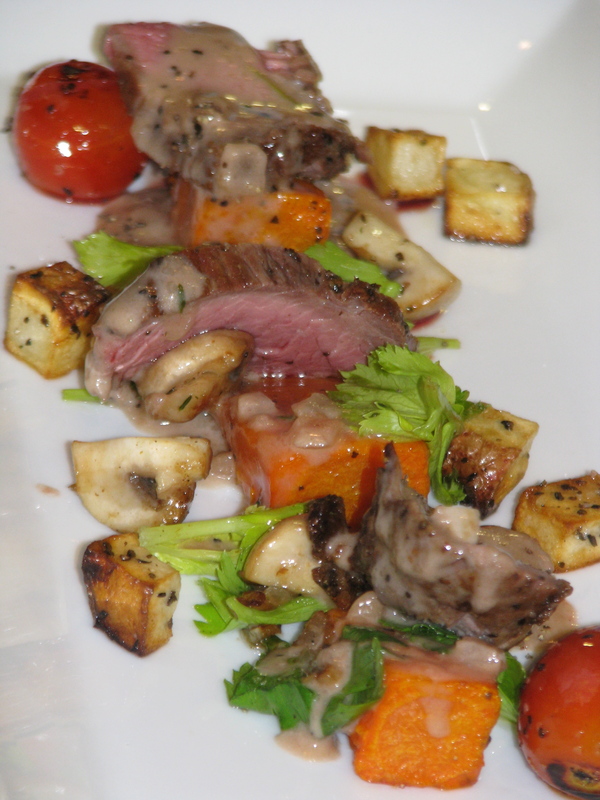 Top sirloin dish by Simply the Best. Heat 3: Jason Godwin and Joel Carr of Simply the Best vs. Tung Nguyen and Howard Austion of Southland Park Gaming & Racing. Heat 4: Ted Roman and Jody Smallwood of the Arlington Hotel vs. Rob Nelson and James Rose of River Grille. Winner: Rob Nelson and James Rose of River Grille. 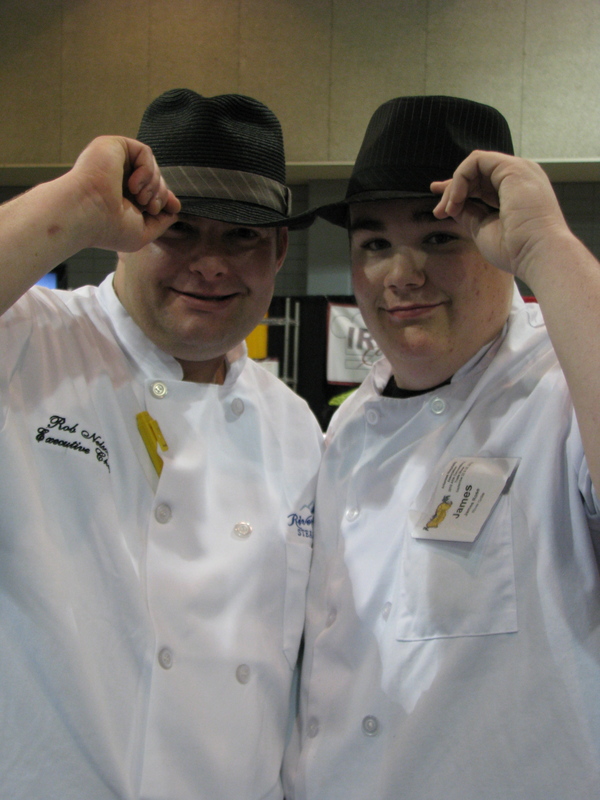 Iron Chef winners Rob Nelson and sous James Rose of River Grille. Chef Rob Nelson busting a move. 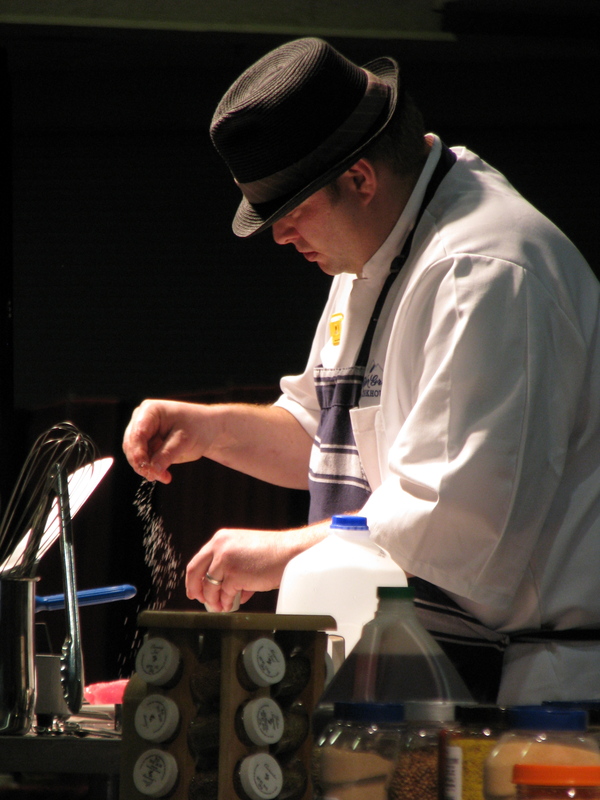 Here are some photos from the convention, as well as Wednesday’s heats of Iron Chef. Please forgive any lack of detail until I have time to fill in. The crowd begs for more (ha) at the Pulaski Tech table. I worked among an army of white-clad culinary students at Friday’s Wildwood Wine and Food Festival, both to learn from the other chefs there and to bring our own offerings to the party. Our team from Pulaski Technical College Arkansas Culinary School served crab cakes with fruit coulis, stuffed profiteroles (think cream puff), beef wontons with a spicy mango salsa, and the sleeper hit of the party: roasted, overstuffed baby red potato halves. I really loved working the table, answering questions about the school and about our food, or cooking in general. It’s one of those moments my PR background comes in handy, I guess. If you saw my tweet about the focaccia…well…it didn’t make it there. Apparently I overmixed a bit, and they were a little tough. I guess we’re at school to learn, right? I think they’re going to serve some of the better pieces at the school café. Consider yourself forewarned. Lewis Curtis, executive chef at Lulav, cooked two dishes while a flurry of attention buzzed around him. This Wednesday marks the premiere of this season’s Hell’s Kitchen, where he is among the cooks up against Chef Gordon Ramsay’s simmering temper. My quick observation of Curtis: talented and delightfully punkish, the one you’ll “love to hate” on the show. Lulav is holding a premiere viewing party Wednesday; call for details at (501) 374-5100. The best dish, in my humble opinion, was by Chef Daniel Capello of the Chenal Country Club: an amazing pecan wood roasted wild king salmon topped with (!) sea beans on a corn brioche, with garlic aioli and a tomato-corn relish. Capello said the salmon had just been flown in that morning, and however the heck he roasted the thing, it was tender and melty as butter. Remind me to camp out in his kitchen sometime and absorb his awesomeness. Thought I’d give you guys another writing sample from my Professional Food Writing class. This was today’s assignment, writing about our favorite TV food show. Of course, mine is Good Eats. Here’s the writeup. Can you guess which line is my favorite? Take one part Julia Child, one part Monty Python and one part Mister Wizard, and the result is Good Eats, my favorite culinary television show. Host Alton Brown identified these three elements as the original inspiration for the show during its recent 10th anniversary special. And once a viewer hears this explanation, it makes perfect sense. The show is a wild mishmash of basic culinary methodology, explanations of the science behind it, and silliness in the art of dry, outrageous British humor. Behind all the silliness, however, is sound culinary instruction. In my first semester of culinary school, almost every topic covered, I had already learned on the show. So, for all those folks who have told me you want to study food but can’t go to school…just watch Good Eats. A few examples: Béchamel sauce. Muffin vs. biscuit vs. creaming method. Knife skills and equipment. Salts. Angel food cake (and other egg foam method products). Omelets. Yeast breads. Mise en place. Emulsions. Even basic sanitation procedures. All of these were “introduced” this semester in school, and I had already seen, learned, and often, cooked them from watching Good Eats. Today, Brown is known as Food Network’s most demanding producer, having had a previous career in film production. He writes, produces and stars in every episode of Good Eats, with a fun-loving precision cited by many of his fellow celebrity chefs. When featured alongside these other chefs, however, Brown often seems uncomfortable and aloof. Having a similar inward nerd, outward performer personality, I can completely understand. Among friends and staff, alone on camera, he is in his creative element. Just don’t throw him in the pool with the “cool kids” unless it’s by his own script. The remaining bulk of the show follows Brown through the planning, mise en place, cooking methodology, and my favorite — instructional aids. These may appear in the form of sock puppets (most commonly portraying belching yeast), Barbie theater, chalkboard drawings, Python-style cartoonery, plastic mesh (gluten), styrofoam molecules, and even humans, such as Deb Duchon, a real, live nutritional anthropologist. Although the high degree of silliness may be too much for some, my brain soaks it up like a sponge, along with the cooking knowhow that comes with it. In the past couple years or so, I’ve learned to make so many things…smoked meats, authentic red beans and rice with pickled pork, killer chili, garlic-laden chicken, shrimp ramen pouches and more sweets than I can remember. And that, dear reader, is good eats.